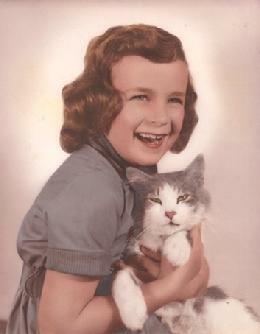 Some of my happiest memories are of my first best friend, a long-haired grey and white tomcat named Fluffy. Fluffy and I spent most of each of my pre-school days together. I’d follow him around, he’d follow me around, each of us always curious about what the other was up to. But of all of our times together, tea times were definitely the best. Well, for me at least. I’d dress Fluffy up in a sweater and bonnet, and wheel him in a baby carriage to join an odd array of dolls and stuffed animals for tea, tuna fish, and cake. Fluffy was a patient and polite guest, but he never stayed put much beyond the serving and consumption of the tuna fish. Ever since that time in my life, every pet with whom I’ve ever shared my life has proved to be a very dear friend, and often a best friend. I cannot recall a happy memory in my life that does not, at least in some measure, include my pets. Yet, just as my fondest memories are of my pets, so too are the most heart-rending. Each and every loss of a pet is so very deeply painful, filled with sorrow and regret. And, quite cruelly, it would seem that the deeper the bond, the longer the grieving, and the longer for the happy moments to wash back into memory. The purest of joys and the deepest of sorrows so often come to all of us through our relationships with our companion animals. When one considers our companion animals’ promise of unconditional love, unwavering loyalty, complete lack of guile, and complete absence of premeditated malice, finding that we allow ourselves the deepest of emotional bonds with them should be of absolutely no surprise. The true surprise should be that they entrust themselves so wholly to us, but therein lies the reciprocity of our relationships with them. Somewhere between Fluffy and today, my pets became less my friends and more my responsibility. My resolutions for the New Year shall be to correct that, to spend more time with them with an awareness of celebrating our companionship with joy and gratitude. I’ll bet Lucky will look awfully cute in a sweater and bonnet. This article by Kristina Dow appeared in the December 2010 issue of 'Our Berkshire Green'.